Bartelt was named the 2018 Region 3 Regional Contractor of the Year (CotY) by the National Association of the Remodeling Industry (NARI) in the Entire House $250,000 – $500,000 and Residential Bath Over $100,000 categories. Bartelt was selected as the winner of Region 3 North Central, an area that includes contractors from Illinois, Iowa, Kansas, Minnesota, Missouri, Nebraska, North Dakota, South Dakota, and Wisconsin. Contractors from seven regions around the country vie for CotY Awards on an annual basis, and all regional winners will now be eligible for the National CotY Awards. National winners will be honored at NARI’s Evening of Excellence Reception on Friday, April 20, 2018, in Charlotte, North Carolina. The scenic backdrop drew this couple to the home, but the interior lacked style and function. It was vital to eliminate the compartmentalization on the first floor and create a home more conducive to entertaining. The remodeled spaces are now a balanced mix of feminine and rustic details – a blend of their individual tastes. The project features decorative lighting, antiqued oak floors, a distressed beam mantel, and a large kitchen. An open staircase with floating treads is the focal point of the first floor, and a master suite addition takes advantage of the home’s views and serves as a retreat. These empty-nesters lead a busy life, often traveling for work. They wanted to update and expand their master bathroom to create a retreat after their time away and mimic the luxurious places they’ve visited. The remodeled space is flooded with natural light and boasts unique finishes that exude elegance and complement the homeowners’ eclectic taste. It features water jet cut glass and marble tile, a custom metallic-finished vanity, a freestanding tub, porcelain tile resembling marble, and a large frameless glass shower. It is also equipped with ample storage and “elbow room” for two. This entry was posted in Awards, In the News and tagged Colgate Remodel, Contractor of the Year, Contractor of the Year Award, CotY, CotY Award, Delafield Remodeler, Entire House Remodel, First Floor Remodel, Home Improvement, Kitchen Remodel, Lake Country Remodeler, Master Bath, Master Bath Remodel, Master Bathroom, Master Bathroom Remodel, Milwaukee NARI, Milwaukee Remodeler, NARI, NARI Contractor of the Year, NARI CotY, NARI CotY Winner, NARI National, National Association of the Remodeling Industry, Regional Award, Regional Contractor of the Year, Regional CotY, Regional Remodelers Awards, Regional Remodeling Award, Remodelers Awards, Remodeling Award, Southeastern Wisconsin Remodeler, Waukesha Remodeler, Wauwatosa Bathroom Remodel, Wauwatosa Master Bath Remodel, Wauwatosa Master Bathroom Remodel, Wauwatosa Remodel, Whole House Remodel, Wisconsin Remodeler on February 5, 2018 by amanda. May is National Home Improvement Month, so throughout the past few weeks, we have posted photos of some of Bartelt’s award-winning projects. Here is a compilation of those posts! This 1800s farmhouse remodel has a balanced mix of rustic and refined details – barn beams, painted cabinetry, fieldstone, coffered ceilings, distressed wood. This home is a blend of traditional elements and modern details. It features marble, painted cabinetry and gorgeous lighting. The spaces also boast unique materials like goldleaf tile and textured wallpaper! Our clients wanted a layout more conducive to entertaining and spaces that reflected their style and setting. The first floor features custom cabinetry, wrought iron light fixtures, slate tile, textured granite, and hand-scraped beams, creating a rustic aesthetic. This sunroom addition is the perfect spot to host family and friends. It features a bar, easy access to the kitchen, a Lannon stone fireplace, and a direct connection to outdoor entertaining spaces. Our clients’ 1800s Victorian lake home had been turned into a four family residence. It was their goal to restore it back to a single family home and reintroduce its original charm. This project features painted cabinetry, a tin ceiling, fireplace restorations, a bed nook for the grandchildren, and other details complementing the character of the home. This master bath features a custom vanity, a tub with a granite deck, and a frameless glass shower. The shower bench boasts porcelain- and marble-filled mosaic tile and mimics the curve of the vanity and tub. The homeowners wanted to update the home to accommodate their modern lifestyle while complementing the home’s original charm. This remodel features a new master suite, an exterior update, a new detached garage, a family room transformed from the old garage, and an expanded kitchen. This home was originally a 1850s barn and was converted to a home in 1938. Throughout the addition, it was important to create a rustic, yet refined aesthetic. This was achieved with beams, board and batten siding, shakes, layers of lighting, exposed wood, and other selections that acknowledge the home’s barn past. This kitchen is ideal for entertaining. It features a large island, efficient storage, double sinks, and a large arched opening into the family room (keeping the spaces open yet defined). This stunning lake home basement has it all – a bar with a copper top and a Lannon stone wall, a wine storage room, and a cozy family room for movie nights (not to mention a ton of space to entertain friends and family)! The homeowners wanted to enhance the home’s original charm while highlighting their eclectic style. The remodel features a new mudroom, kitchen expansion, family room, butler’s pantry, first floor bathroom, dining room and master bathroom. Throughout the project, it was important to increase the natural light in the home and make the spaces more conducive to entertaining. This remodeled lower level offers a comfortable and contemporary spot for the family. 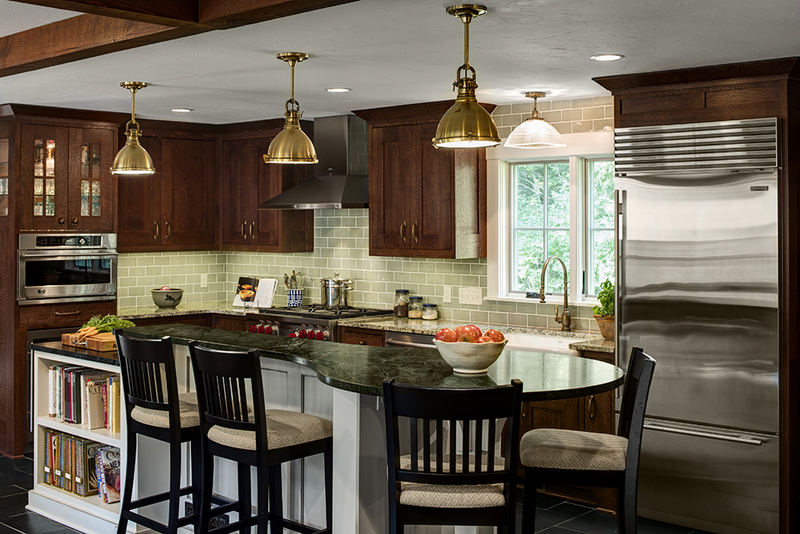 It features a bar with pepper gray cabinetry, a stacked stone backsplash, and textured granite. Neighboring the bar, a modern fireplace with a floating hearth serves as the focal point of the lower level. The lower level also includes a theater room with a “starry” ceiling – the perfect spot for the kids! We created a layout conducive to entertaining and updated this kitchen without straying too far from the feel of the home’s existing spaces. The space features custom, raised panel birch cabinetry, travertine subway tile, and granite countertops. It also has a two-level island, making it multi-purpose: one level for food prep and the other with seating for six. This finished lower level features a bar with leather-textured granite, character-grade cherry cabinetry, a stacked stone backsplash, and beverage refrigerators. Neighboring the bar, the family room includes a stacked stone fireplace. Arched openings, weathered beams, and travertine tile run throughout the basement, adding character to the space. The homeowners wanted to update the home to accommodate their modern lifestyle, showcase their eclectic style, and take advantage of their beautiful setting. The exterior of the house was transformed with a metal roof, fieldstone, low maintenance siding, a pergola, cedar columns and brackets, and a screen porch. Inside the home, each room tells a “story,” with reclaimed pieces throughout the first floor – barn doors, beams, and boards. The homeowners wanted to expand their home to accommodate their family of 7. This project doubled the size of their home and created functional spaces – a larger kitchen, a family room, a mudroom with custom lockers, a three and a half car garage, bathrooms, and other living spaces. The homeowners wanted to update the kitchen for their modern lifestyle while restoring and preserving the home’s original character. The space features a copper tin ceiling, custom furniture-style cabinetry, and soapstone. This beautiful lake home features a new kitchen with custom crackle-finish cabinetry, a custom cherry table, a wet bar, and toe kick lighting. The two fireplaces serve as focal points for the first floor. The fireplace, the lower level’s focal point, is a carved face of Prometheus, Greek god of fire. It features votive candles inset in his hair and beard. The basement also features a full kitchen with a hutch-like sink area, copper details, and reclaimed beams. The homeowners wanted their home to have an arts and crafts look. The remodeled exterior features low maintenance siding, a cedar pergola, a historically correct color scheme, and a custom quarter sawn oak door. This eye-catching kitchen features custom cabinetry and paneled appliances, a limestone hood, a crackle-finished island, and a copper farmhouse sink. This lower level is ideal for entertaining – bar, family room, game area. The space features granite tops, custom cherry cabinetry, a game table at the bar, custom storage for pool cues, and double crown molding at the ceiling. This entry was posted in Awards, Tips and tagged Awards, Chrysalis, Chrysalis Awards, Chrysalis Awards Winner, Contractor of the Year, Contractor of the Year Award, CotY Award, Delafield Remodeler, Home Improvement, Home Improvement Month, Lake Country Remodeler, Local Remodelers Awards, Local Remodeling Awards, Master Design Awards, May Is National Home Improvement Month, Milwaukee NARI, Milwaukee Remodeler, NARI, NARI CotY, National Association of the Remodeling Industry, National Home Improvement Month, National Remodelers Awards, National Remodeling Awards, Qualified Remodeler, Regional Chrysalis Award, Regional Remodelers Awards, Regional Remodeling Awards, Remodel Awards, Remodelers Awards, Remodeling Awards, Southeastern Wisconsin Remodeler, Waukesha Remodeler, Wisconsin Remodeler, Wisconsin Remodelers Awards, WRAs on May 31, 2017 by amanda. Bartelt was named the 2017 National Contractor of the Year (CotY) by the National Association of the Remodeling Industry (NARI) for the Entire House $500,001 – $750,000 category. Contractors from seven regions nationwide vie for the awards on an annual basis. An impartial panel of judges, who are experts within the industry and associated fields, selected winners based on problem solving, functionality, aesthetics, craftsmanship, innovation, degree of difficulty and entry presentation. Earlier this year, NARI named 172 Regional CotY winners with 27 team members who advanced as finalists to the national level. NARI announced a National winner in each of the 37 categories at its Evening of Excellence reception, held in Scottsdale, Arizona. After previous remodels, the winning project was dated, and the spaces lacked unity. The homeowners wanted to enhance the home’s original charm, creating a cohesive design throughout the various rooms, while highlighting their eclectic style and accommodating their modern lifestyle. The remodel features a new mudroom, kitchen expansion, family room, butler’s pantry, first floor bathroom, dining room, and master bathroom. Throughout the project, it was important to increase the natural light in the home and make the spaces more conducive to entertaining. Now, the home is a balanced mix of the homeowners’ eclectic taste and more traditional details. Bartelt worked with interior designer Jeff Wasserman to complete the project. See the winning project on Houzz. This entry was posted in Awards, In the News and tagged Bathroom Remodel, Contractor of the Year Award, CotY Award, Delafield Remodeler, Entire House Remodel, Entire House Renovation, Family Room Remodel, Four-Season Room Remodel, Home Improvement, Home Remodel, Home Remodeling, Home Renovation, Kitchen Remodel, Lake Country Remodeler, Living Room Remodel, Master Bathroom Remodel, Master Suite, Master Suite Remodel, Milwaukee Remodeler, NARI, NARI Contractor of the Year, NARI CotY, NARI National, National Contractor of the Year, National CotY, Remodeler Award, Remodeler Awards, Remodeling Award, Remodeling Awards, Southeastern Wisconsin Remodeler, Sunroom Remodel, Waukesha Remodeler, Wauwatosa Remodel, Whole House Remodel, Whole House Renovation, Wisconsin Remodeler on April 17, 2017 by amanda. Bartelt was named the 2016 Regional Contractor of the Year (CotY) by the National Association of the Remodeling Industry (NARI) for the Residential Addition Over $250,000 category. Bartelt was sel ected as the winner of Region 3, an area that includes contractors from Illinois, Iowa, Kansas, Minnesota, Missouri, Nebraska, North Dakota, South Dakota, and Wisconsin. Contractors from seven regions around the country vie for CotY Awards on an annual basis, and all regional winners will now be eligible for the National CotY Awards. National winners will be honored at NARI’s Evening of Excellence on Friday, April 8, 2016, in Austin, Texas. The winning Bartelt project was originally an 1850s barn and was converted to a home in 1938. With so much charm and history, the homeowners wanted to retain and enhance the home’s original character while accommodating their modern lifestyle. The two-story addition houses a new mudroom, kitchen expansion, hearth room, master suite, and attached garage with a bonus room. Throughout the addition, it was important to create a rustic, yet refined aesthetic. This was achieved with beams, board and batten siding, shakes, layers of lighting, exposed wood, and other selections that acknowledge the home’s barn past. Competing projects were completed between December 1, 2013, and November 30, 2015, and were not submitted in prior NARI National contests. An impartial panel of judges who are experts within the industry and associated fields selected winners based on each entrant’s submission, which include “before and after” photography and project descriptions. Judging focused on problem solving, functionality, aesthetics, craftsmanship, innovation, and degree of difficulty. To be considered for a CotY Award, a company must be a NARI member in good standing. NARI members represent an elite group of the approximately 800,000 companies and individuals in the U.S. identifying themselves as remodelers. See more photos of the winning project on Houzz! This entry was posted in Awards, In the News and tagged Addition, Award, Award-winning Remodeler, Awarding Winning Remodeler, Awardwinning Remodeler, Barn, Contractor of the Year, Contractor of the Year Award, CotY, CotY Award, Delafield Remodeler, Elm Grove Remodel, Farmhouse, Home Improvement, Milwaukee Remodeler, NARI, NARI National, National Association of the Remodeling Industry, National Remodeling Competition, Regional Award, Regional Contractor of the Year Award, Regional CotY, Regional Remodeling Award, Regional Remodeling Competition, Remodelers Award, Remodeling Award, Residential Addition, Southeastern Wisconsin Remodeler, Waukesha Remodeler, Wisconsin Remodeler on February 2, 2016 by amanda.